​The story of a dad who's really good at playing horsey, and the kids who rescue him from a rodeo. A picture book by Troy Cummings. Yee-haw! GIDDY-UP, DADDY has left the corral! 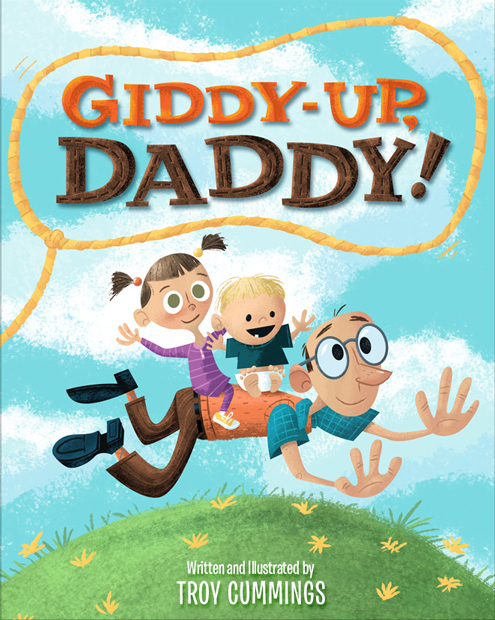 Saddle up for the high-tailin', hay-balin', happy-trailin' story of a dad who's really good at playing horsey! So good, he's mistaken by for a real horse and kidnapped--by rustlers! WHOA! Is this the end of our clip-clop pop? NEIGH! Not when his kids take the reins and rescue him from the rodeo. "...a boisterous tribute to devoted fathers"
"...an unabashedly unsentimental laugh-out-loud tale that celebrates fathers’ loving, playful side—as well as their stamina"